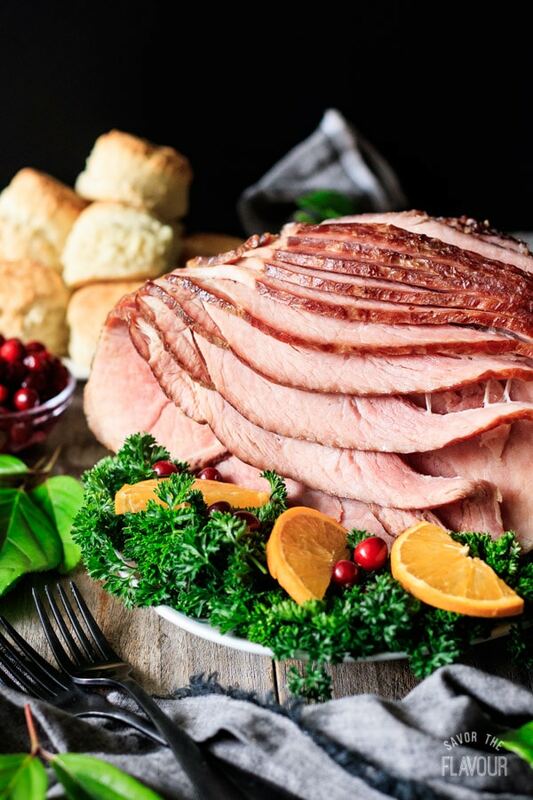 How to cook a spiral ham is an easy recipe to bake in the oven for your family's next holiday dinner. It's a perfect low carb meat for Easter, Christmas, and Thanksgiving. This savory ham is moist and juicy, and is not sweet. It's easy to make this crowd favorite with all the pro tips in this recipe! Have you ever wondered how to cook a spiral ham? This recipe will answer your questions and will increase your kitchen confidence by giving you lots of pro tips. 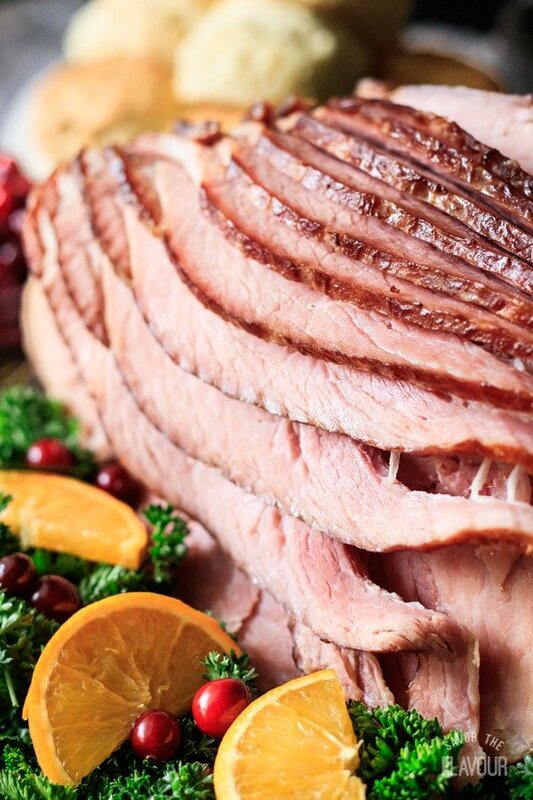 Serve a moist, juicy holiday ham this year for your family’s special occasions; it’s simple to do. How do I prepare a spiral ham? Take it out of the fridge 1 to 2 hours before cooking so the internal temperature increases. It will cook quicker and more evenly. Remove all the packaging, netting, plastic bone disk, and throw out the glaze packet. If you want a glaze, make your own. There’s no need to rinse. How do I keep a spiral ham from drying out? Add 2 cups of unsalted chicken broth or water. Place cut side down in roasting pan. Roast 12 minutes per pound or until 125-140 F.
How much ham do I need for 6 adults? If you have a bone in ham, you’ll need 1/2 to 3/4 pound per person. If you want leftovers, buy 1 pound per person. 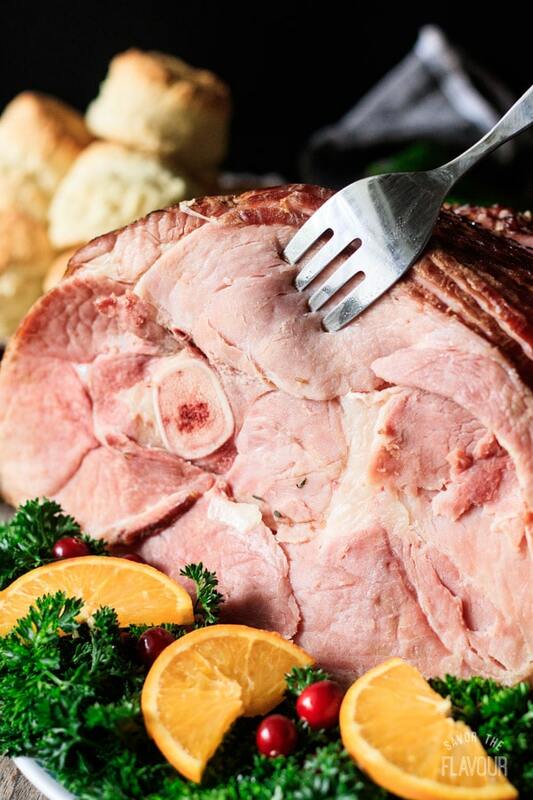 If you are serving a boneless ham, you’ll need less than 1/2 pound per person. 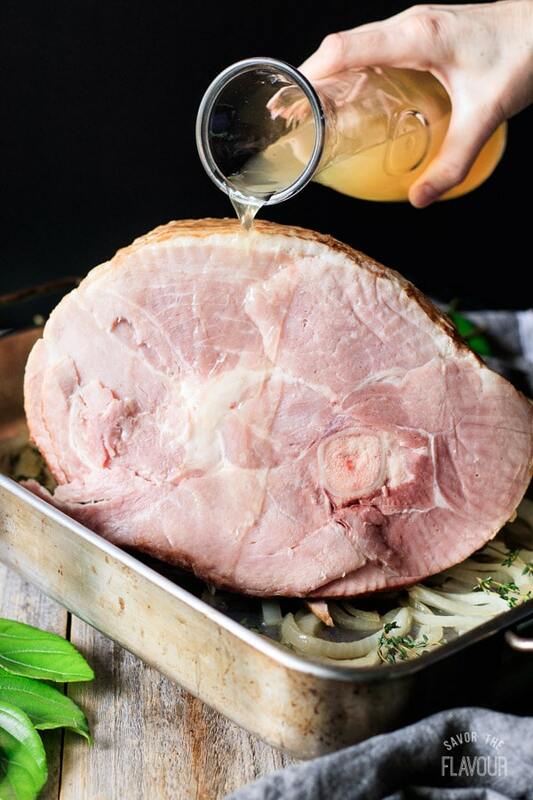 Do you let a ham rest after cooking? Yes, let the cooked ham rest for 15 to 20 minutes before serving. Remove the spiral ham from the roasting pan. Place the ham on a large cutting board. Tent loosely with foil. This will allow the internal temperature to increase by 5 to 15 degrees and will let juices redistribute. What ingredients are in a ham glaze? Choose your ingredients from the list above: something sweet, something for the tang, and your spices. Put all your ingredients in a small saucepan, over medium low to medium heat, mix well, then simmer for two minutes. Remove from the heat, the glaze will thicken as it sits. If it thickens too much, just reheat over medium low heat for 30 seconds. When do you glaze a ham? 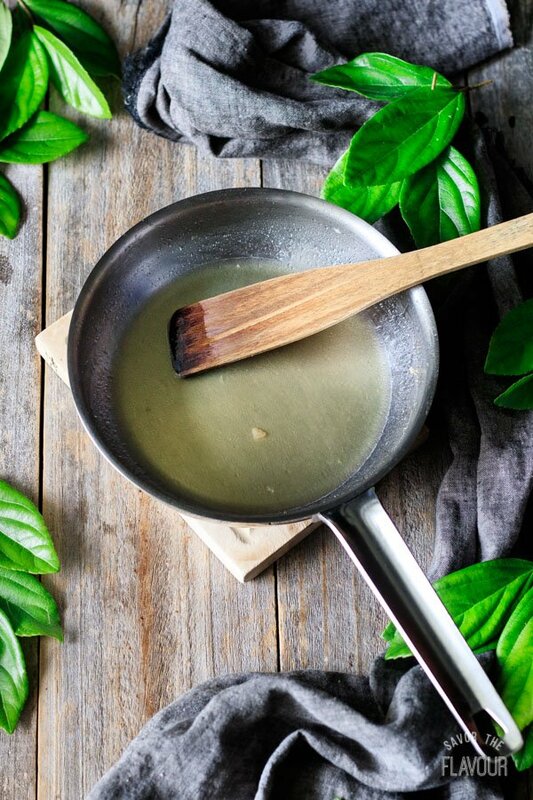 Most chefs divide the glaze into thirds. Some chefs apply the first glaze on the cut side and in between the slices before it’s covered with foil. Most chefs apply the first glaze during the last 20 to 30 minutes after the foil has been removed. Increase the oven temperature to 400 F during the last 20 to 30 minutes so caramelization can occur. Apply the second glaze during the last 15 to 10 minutes of cooking. Apply the last glaze after it’s done cooking and before tenting with foil. What cooking techniques can I use to get the glaze to caramelize? Increase the oven temperature to 400 F for the last 30 to 20 minutes of cooking, then apply the glaze to the ham. If this technique doesn’t give you the caramelization you want, put the ham under the broiler for 3-5 minutes, watching carefully so it doesn’t burn. If you prefer, use a kitchen blow torch to caramelize the glaze after the ham has been cooked in the oven. Is bone in ham better than boneless? Boneless ham is easier to slice. Bone in ham has more flavor because the bone gives more flavor to the meat while it cooks. Bone in ham has the bone which you can use for soups, collard greens, red beans and rice, or black eyed peas. What side dishes go with ham? Set up a carving station in your kitchen and not at the dining room table. 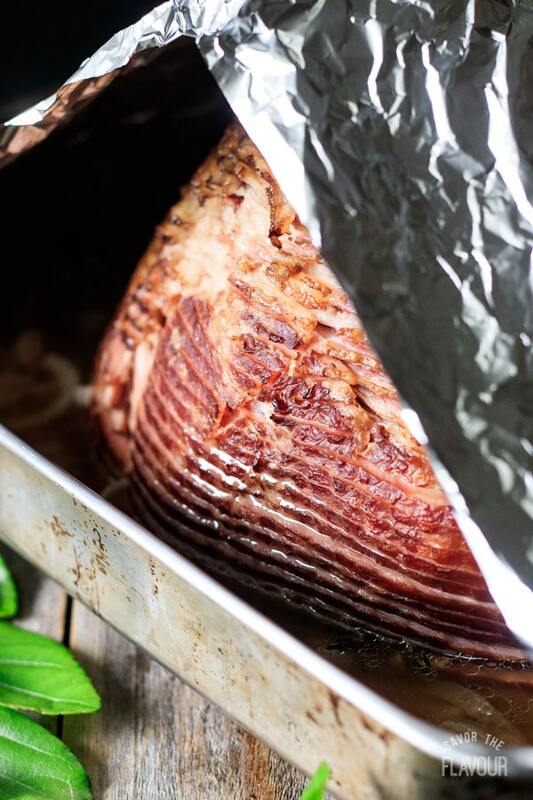 Let your cooked, tented ham rest 20 to 30 minutes before carving on a cutting board. Put the ham on its side. Unlike beef, the grain of a ham isn’t uniform. Use a paring knife to cut around the bone. Cut around the visible seams using a carving knife. These are lines of fat which naturally separate a ham into 2 to 4 sections. Slice above the bone to remove an entire section. Turn the ham cut side down and slice down along the bone. Carefully lay the cut pieces on a platter for serving. If pieces are too large, stack a few and cut smaller. Optional, garnish your meat platter with curly parsley, orange slices, fresh bay leaves or red grapes. A cooked ham can sit out at room temperature for up to two hours. Any leftovers should be tightly covered and refrigerated for up to 4 days. Yes, but wait until it’s fully cooled. Slice or cube the ham, then put in an airtight container or a zip top freezer bag and remove the extra air. Keep in the freezer for up to two months. Gather all the ingredients. Slice the onion and separate it into rings, then peel the garlic cloves. Move the oven rack to the lowest position so the ham will be in the center of the oven. Preheat the oven to 275 F and remove all packaging from the spiral ham. Melt the butter in a small skillet over medium high heat. Saute the sliced onion until soft, then add the garlic cloves and cook for two minutes, stirring constantly. 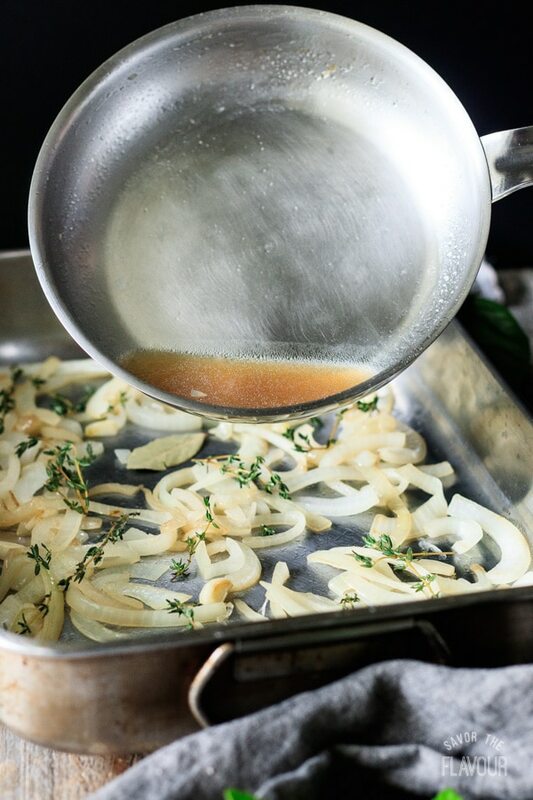 Transfer the onion and garlic cloves to the roasting pan, then add the fresh thyme sprigs and the bay leaf. Deglaze the skillet with 1/4 cup chicken broth. Scrape the browned bits, called the fond, off the bottom of the skillet with a wooden turner or spoon. Pour the fond into the roasting pan. Place the spiral ham in the pan and pour the chicken broth on top. Tent the ham loosely with foil. This will allow the internal temperature to increase 5 to 15 degrees and allow the juices to redistribute. 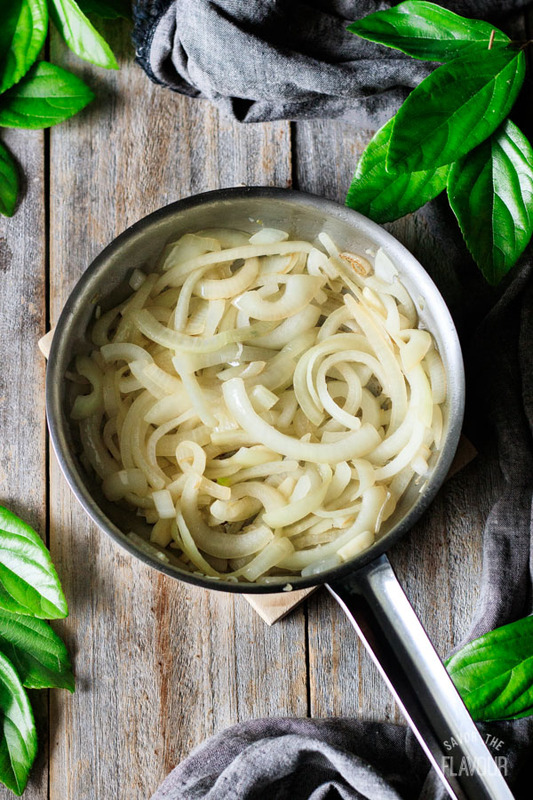 Use a slotted spoon to remove the sliced onion and garlic cloves from the roasting pan. Place them in a bowl and serve with the ham. Pour the pan juices into a bowl. Use the pan juices to baste the ham after it has rested. You can also make a pan gravy with the drippings. Serve the spiral ham with the slices onion and garlic cloves, and a spoonful of pan drippings. You can also serve the ham with spiced applesauce, mustard sauce, or ham gravy. Want more flavor? Use bone-in ham instead of boneless. Want to cut down on baking time? Let the ham stand at room temperature for 1 hour to increase the internal temperature. Should I soak, rinse, or wash my spiral ham? There is no need to rinse, wash, or soak a spiral ham. How should I position the ham? Cook a spiral ham with the cut side down to preserve moisture. Cover or uncover? Cover with foil to prevent moisture from escaping at first, then uncover for the last 30 minutes. Need moisture? Add 2 cups of unsalted chicken broth to the roasting pan, place a shallow pan with water on the oven rack, or use an oven bag. Want a glaze? Remove the foil. Increase the temp. to 400 F. Brush it on every 15 minutes during the last 30 minutes and before tenting. Don’t want a glaze? Make a ham gravy from the drippings. You can also serve it with spiced applesauce, mustard sauce, or the cooked onions and pan drippings. Should I use a meat thermometer for a spiral ham? Yes, insert it the thickest part of the meat. You’ll want a reading of 125-140 F.
Why tent with foil? The internal temperature will continue to rise 5 to 15 degrees, and the juices will redistribute. Let it rest for 15 to 20 minutes. Keep the ham bone. Use it for soup, collard greens, black eyed peas, or red beans and rice. Looking for leftover ham recipes? Why not try one of these? Ham and Peas Bow Tie Pasta: ham and peas tossed with bowtie pasta and a luxuriously creamy sauce. 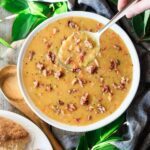 Split Pea Soup: a French Canadian soup that has been a family favorite for over a decade. Cheesy Ham and Potato Casserole: a simple comfort food dinner that’s easy to make. The pleasure of a 5-star review for how to cook a spiral ham would be greatly appreciated. 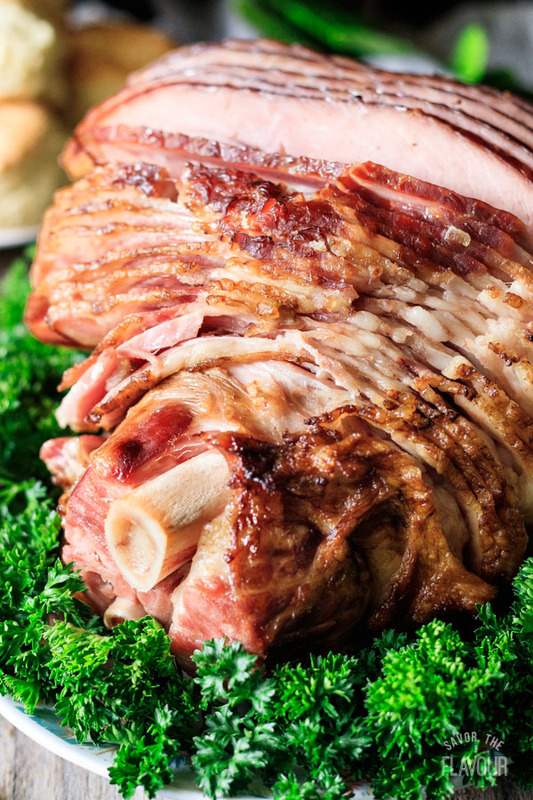 How to cook a spiral ham is an easy recipe to bake in the oven for your family’s next holiday dinner. It’s a perfect low carb meat for Easter, Christmas, and Thanksgiving. This savory ham is moist and juicy, and is not sweet. It’s easy to make this crowd favorite with all the pro tips in this recipe! Move the oven rack to the lowest position in the oven, this will allow the ham to be in the center of the oven. Preheat the oven to 275 F, and remove the packaging from the spiral ham. Melt the butter in a small skillet over medium high heat and saute the onion until soft while stirring occasionally. Add the garlic cloves and saute for two minutes, stirring constantly. 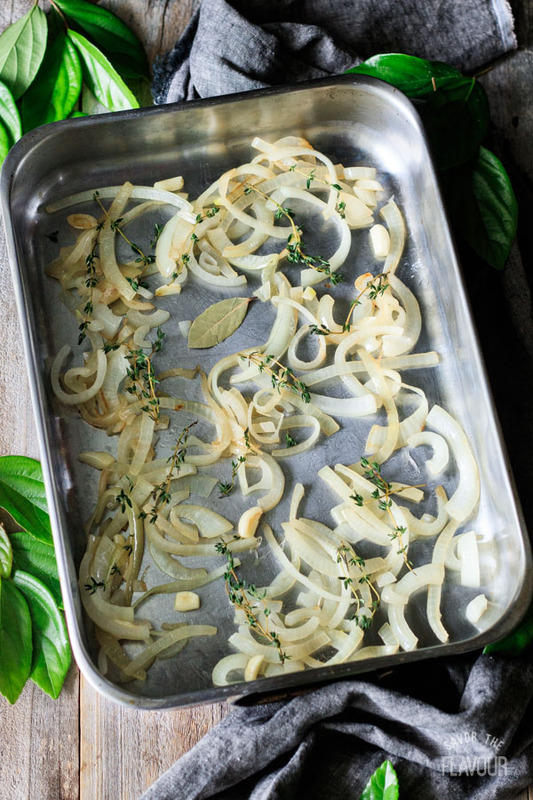 Transfer the onion and garlic to the roasting pan and add the fresh thyme sprigs and the bay leaf. Deglaze the skillet with 1/4 cup of unsalted chicken broth. Scrape the browned bits off the bottom of the skillet with a wooden turner or spoon. Pour the liquid from the skillet into the roasting pan, then pour the rest of the chicken broth into the roasting pan. Place the spiral ham cut side down on top of the onion slices and cover tightly with foil. Cook at 275 F for 12 minutes a pound or until a meat thermometer reads 125 – 140 F. A 10 pound spiral ham would take roughly 2 hours. Uncover the ham during the last 30 minutes. 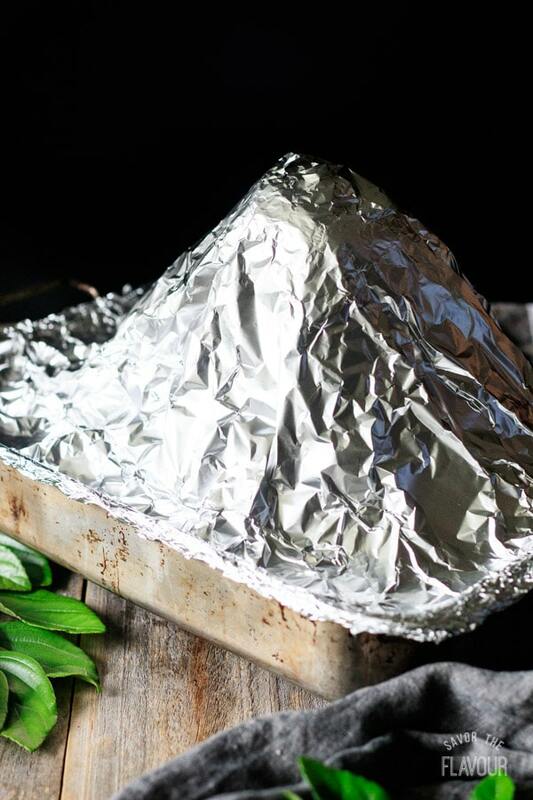 Remove the ham from the oven and tent with foil. Let the ham rest for 20 minutes so the juices can redistribute. Remove the sliced onion and garlic cloves from the roasting pan and place in a serving bowl. Pour the pan juices in a bowl and skim the fat off. Use the pan juices to baste the sliced ham after it has rested. If desired, make a gravy with the pan juices. Pour 2 cups of the pan juices into a saucepan. Bring to a boil then reduce heat to medium low. Gradually whisk in a flour slurry. Stir in some savory spices like black pepper to taste. Cook until thicken, roughly 2 to 5 minutes. Remove from heat and stir in a pat of unsalted butter. Remember, if you made your ham with a glaze, your ham gravy will taste more sweet and tangy. 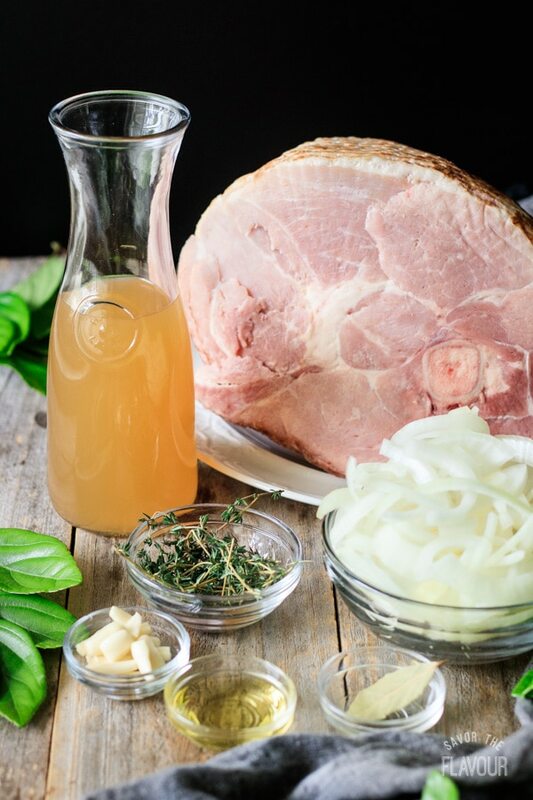 Serve the ham with the cooked onions and garlic cloves, spiced applesauce, a homemade mustard sauce, or ham gravy. The pleasure of a 5-star review for this spiral ham recipe would be greatly appreciated. Ham is one of my favorite meats and this one is the most succulent ham I have ever had. You must try this recipe. Thank you, Beth! I’m so glad you enjoyed it!